LOL Events is proud to announce the advent of its first comedy festival called ‘LOL Fest’. The comedy festival will host an eclectic mix of both well-known and up-coming local and international comedy performers. The soon-to-be annual comedy festival will commence with a week-long Laughter Exhibition, and will continue with 4 days of comedy shows spanning from Thursday July 30 to Sunday August 2. All shows and activities will be held in Publika, Solaris Dutamas. What makes the LOL Fest special is the sheer diversity of specially produced and curated shows. Japanese comedy, bilingual comedy, comedy magic, improvisation comedy and a variety of stand-up comedy shows are all part of a packed 4 day schedule. Shows also vary for different age groups with dual show ratings of ‘13+’ and ‘18+’. There will also be kids-friendly comedy shows on Saturday afternoon at The Square, Publika where proceeds go to a charitable cause. The LOL exhibition themed ‘Laughter Makes the World Go Round’ will be held at the Boulevard of Publika, beginning July 27. This exhibition explores the many different aspects of laughter as perceived through the eyes of various artists from different disciplines and background. It is an exploration of humour and laughter, and what makes it so uniquely human. The exhibition will include photographs, cartoons, doodles, paintings, illustrations and digital images from local and regional artists. The festival will also debut a cluster of Japanese comedians from Yoshimoto Kogyo, one of the biggest entertainment group in Japan with more than 100 years in the industry. A group of nine comedians of varied comedy disciplines will entertain in 2 specially designed shows, one fully in Japanese and the other in English or non-verbal. Featured artist include Kamiyama Ichirou, a senior pantomime artist and Kumada Mashahi, a rhythm comedian akin to the ones you see in Japanese game shows. They will be supported by comedians from the Sumimasu Geinin Project. 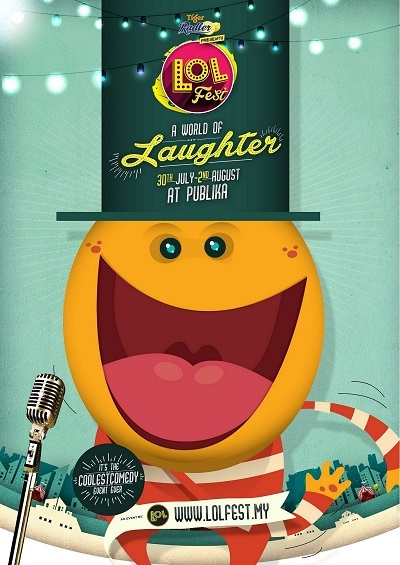 Another highlight show for the festival is the first of its kind, called a ‘Laugh-a-thon’. This unique show will feature some amazing local and international comedy talents in a 6 hour special with more than a dozen performances. Here’s how it works; once a ticket-holder enters the show, they can stay for as long as they want with one catch; one ticket is only for one entry with no re-entries. One ticket, one entry and stay till you are all out of laughs. This show promises to take audiences on an entirely different spectrum of stand-up comedy experience. LOL Events will also be organizing a Charity Bash at The Square, Publika on August 1, 2015 as part of the LOL Fest. The event is catered for all ages and will include family based activities such as a bazaar, performances as well as a charity auction. All proceeds from the event will be contributed to aid those in need. “We are thrilled to announce the conception of the LOL Fest this year. Throughout the past 6 years, LOL Events has worked at establishing a platform for emerging and renowned talents that has both engaged and embraced the local community as well as the entertainment industry,” said Rizal Kamal, founder of LOL Events. “As we enter into this new adventure of sorts, we are excited to continue to showcase and expose audiences to a greater range of comedic talents, and as always, bringing laughter to Malaysians, as we really need them”. Visitors should drop by the Lemon Garden at The Square to juggle lemons or/and participate in the ‘Spin to Win’ contest. Winners will be rewarded with Tiger Radler premiums. On top of that, all ticket holders to the shows at The Bee or Black Box will be given a can of ice cold Tiger Radler. The LOL Fest is presented by Tiger Radler and supported by an array of partners which include Comedy Central Asia, Enrich by Malaysia Airlines, and Uber. Tickets for all the shows available during the LOL Fest will be available to public through Ticketpro Malaysia (www.ticketpro.com.my) ranging from RM40 to RM120. This entry was posted in Party and tagged comedy, festival, lolfest, radler, tiger radler by TheGoodGoodGuy. Bookmark the permalink.